I love to make soups in the winter, and have often written about the wonders of homemade broth. I’ve never cared much for any vegetable broth that I have tasted, and I like the deep savoriness and the economy and thrift of making meat and chicken broth. But recently, more or less by accident, I did discover an alternative. 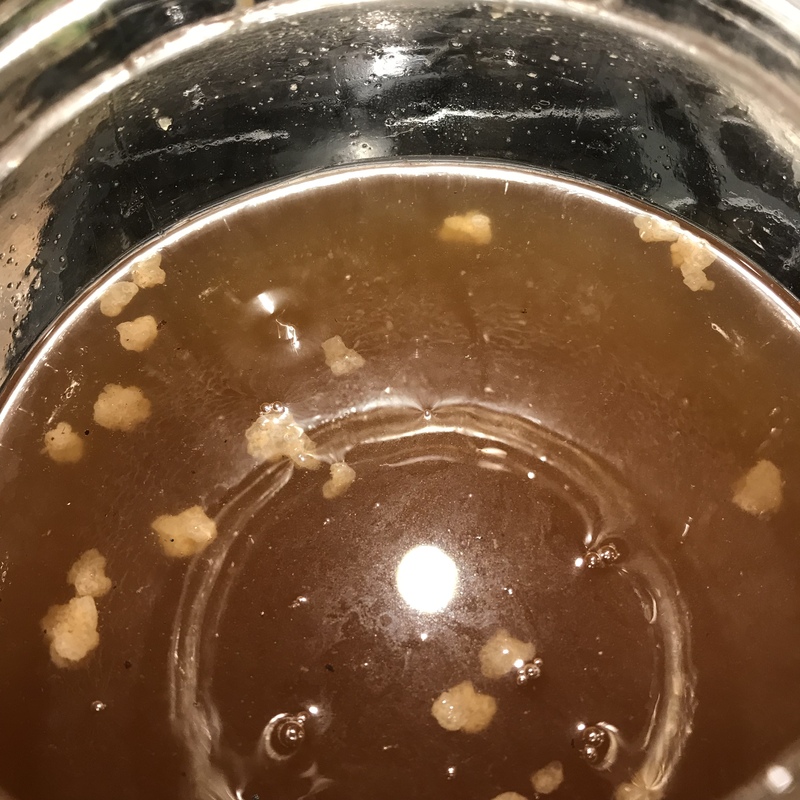 I was experimenting with my abundant supply of water kefir, and was cooking it down to make a syrupy glaze of the type that I have enjoyed making out of kombucha. About the original idea, all I can say is please don’t try this with kefir, because the result is rather dreadful. However, having tasted the product of one pot, I turn the heat off under the other one, which had been reduced to a little more than half its original volume. I tasted, thought, added some salt, and had something that tasted savory and surprisingly like chicken broth. Cooked with some aromatics and herbs, the resemblance would be even more striking. 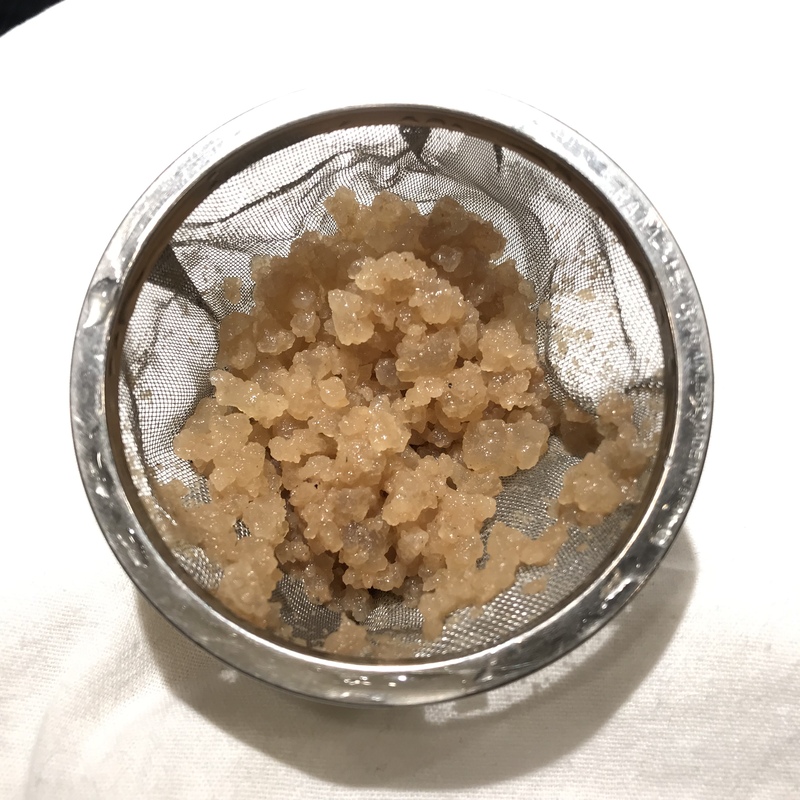 I tried the same experiment with some water kefir made with coconut sugar, thinking that the deeper color and flavor would be attractive in this context. 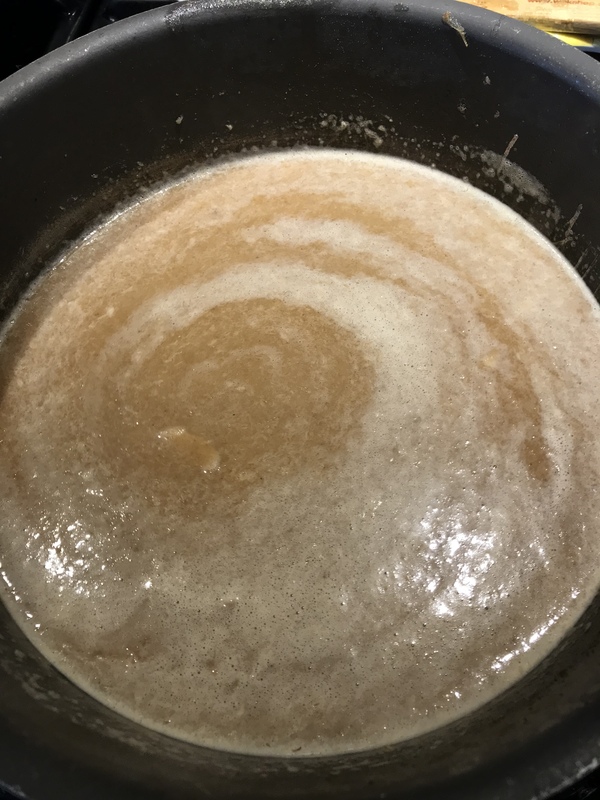 But to my surprise, the faint bitterness that is detectable as an undertaste in brown sugar or coconut sugar was greatly exaggerated in the finished broth, to the point that I threw it out. So save yourself some time and trouble and use plain sugar when making kefir that you intend to cook down. Since I remain obsessed with fermentation months after first reading the Noma Guide to Fermentation, I decided to try combining various fungi both microscopic and macroscopic in a mushroom broth. I had a quart of broth made from boiling down 2 quarts of water kefir. I started with butter, which made my soup vegetarian, but if you wish to use olive oil or some other vegetable oil instead it will be vegan. Heat about 3 tablespoons of your chosen fat in a small heavy sauce pan, and sauté one large or two small cloves of garlic finely chopped and one small onion sliced thin. Cook them over medium low heat, stirring frequently, until they are thoroughly cooked, soft, and a bit caramelized. Put in 3 tablespoons of mushroom powder. I used dried and powdered Sullius that I had gathered, but the most commonly available powdered mushroom is porcini. Sautée the powder for a few minutes, and add a quart of broth to your pan. Bring to a boil, and then turn the heat down to simmer. Now stir in 2 tablespoons of white miso paste. Taste for saltiness. You might want more miso, but taste it first. I am working on making my own miso, but a good grade of white miso from your nearest Asian market is fine. Simmer the soup for 15 to 20 minutes over low heat. The final step is to smooth it out. You can do this with a stick blender, but in my opinion there is no alternative to a Vitamix blender to turn your soup into pure velvet. Make sure you know how to handle hot liquids in your blender without creating a sort of fluid explosion. When the soup is completely smooth, return it to the pan, heat gently, taste for seasoning, grind in a little fresh pepper, and serve. There is nothing quite like the process of fermentation to produce a rich, meaty savor without the use of meat. In this basic recipe, I was experimenting with fermentation as a way to make a vegan or vegetarian product highly satisfying. But if you are not a vegan or vegetarian, there is no reason to feel limited. You can start with bacon fat if you want to, or add chunks of leftover cooked meat, or finish it with a dash of good sherry or a swirl of cream or both. Sautéed mushrooms would be a great addition. It interested me that despite use of miso, this soup doesn’t taste identifiably Asian. It just tastes good. If you want something that leans more Asian, you could add a piece or two of kombu to the kefir for a few minutes as it cooks down and finish the bowls with some diagonally slivered scallions. At the beginning of the year I like to look back on what worked last year and what is still with me. 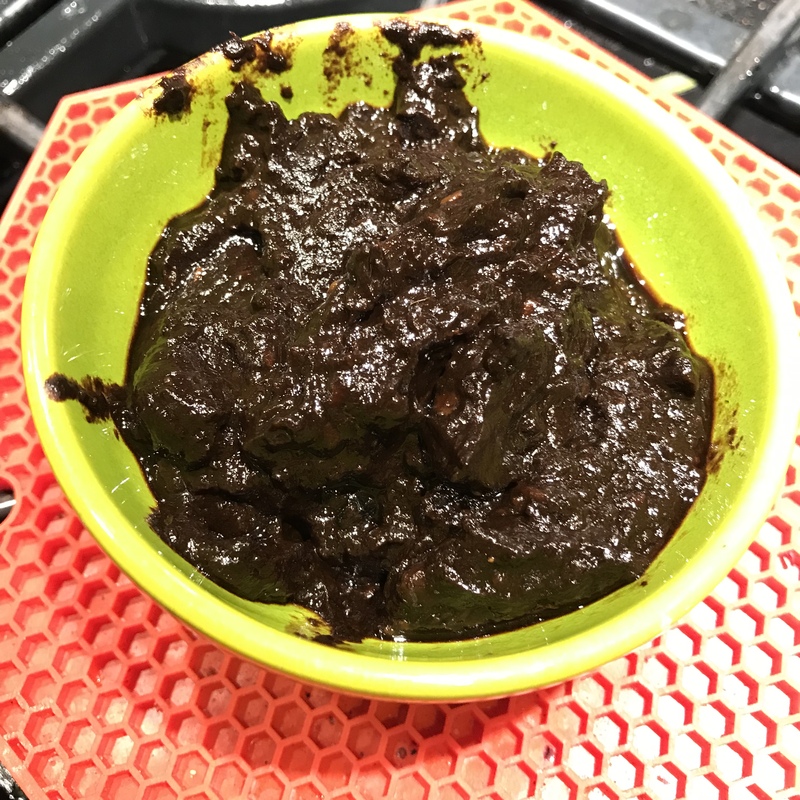 My major category of experiments this fall and winter was fermentation, and this rich dark meaty sauce paste which incorporates multiple fermented ingredients is one of the clear winners. I try to keep some in the fridge at all times because it’s really useful stuff. The foundation is black garlic. 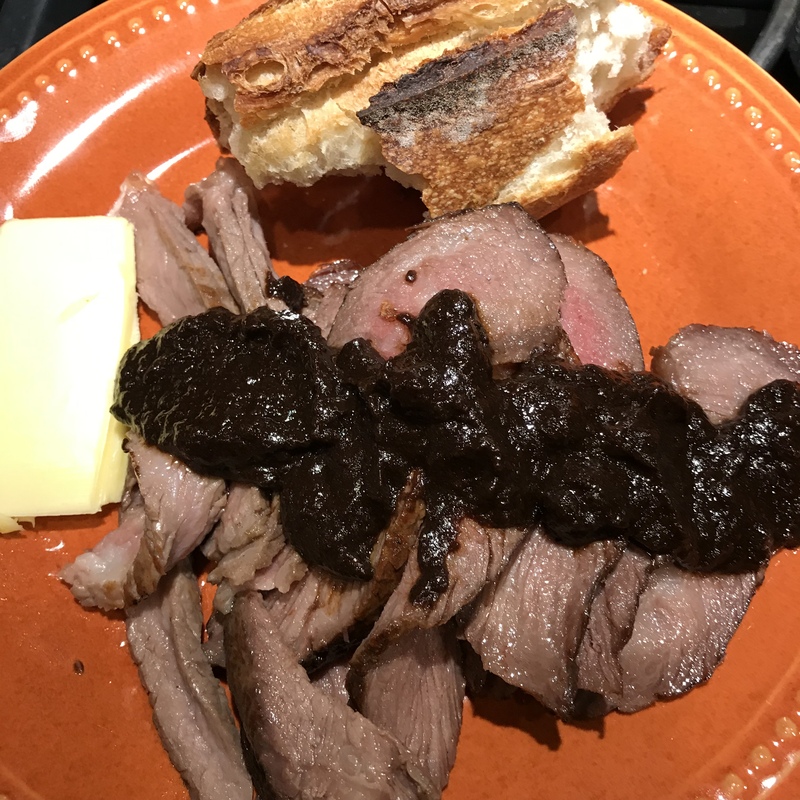 I have come to love black garlic with passionate intensity, and have also had to sadly admit that my own homemade version is not nearly as good as what I can get commercially. I think the difference is the evenness of heat that can be kept in a commercial fermentation chamber, and a rigged rice cooker or slow cooker just doesn’t work as well. One day, no doubt, I will find a safe way to build a fermentation chamber that holds 140°. In the meantime, I buy it from the sources mentioned in my black garlic post. To make the sauce paste pound three of the large Korean style single cloves of garlic or the peeled cloves from one head of regular black garlic with a generous pinch of salt in a mortar and pestle. This supposes that you have one of the big Thai ones meant for ingredients, not the tiny things meant for spices. Keep pounding until the paste is smooth. Pound in a tablespoon of butter, avocado oil, or olive oil. When this is smoothly incorporated, pound in a couple of tablespoons of of lacto-fermented cremini mushrooms and their juice (read more here.) When the paste is smooth again, stir in a tease of colatura or Red Boat fish sauce (I use t teaspoons,) a tablespoon of good red wine vinegar and one tablespoon of your own best balsamic-type vinegar (I use my Concord-must vinegar) or high-quality commercial balsamic vinegar (no grocery-store stuff.) Taste for salt and for acid balance, and adjust as needed. You can double or triple the recipe as long as your mortar is big enough. Now you have a number of possibilities. The paste can be used as is, making sure it’s brought to room temp if you used butter, and can be stirred into soup or eggs or spread on buttered toast or grilled polenta for a tasty side. A spoonful lends distinction to a mug of hot sipping broth. A fewspoonfools are really good tossed into greens at the last minute of cooking. Just don’t be timid with it. The flavors are rich but surprisingly understated. It keeps in the refrigerator for at least a week if tightly covered. It can be thinned to a more sauce-like consistency with a little broth or a little more oil and poured over hot or cold sliced meat. My favorite elaboration is, when pounding in the butter, to keep pounding in more, up to four or five tablespoons instead of just one. If you pound enough this creates a smooth mousse, into which the rest of the ingredients can be stirred. It’s superb as steak butter, wonderful on sourdough bread, great spread on a thick slice of Manchego cheese, and I can easily imagine it dolloped over a plate of hot pan-grilled shrimp. I think it would be great as a topping for broiled salmon, and can imagine it lending a deep meaty flavor to roasted or grilled vegetables. It has become one of the things that I have to have around, and I’m always thrilled when I find things like that. I am experimenting with kombucha and its culinary uses, but for daily drinking I prefer water kefir. It’s a fermented drink with a mildly yeasty tangy flavor and none of the vinegary overtones of kombucha. It can be flavored in a lot of ways, and it’s quick and fun to make. I find the Drinkmate to be the easiest and most exact method of carbonation. I have found the “natural” method to produce erratic and undependable results, but if you want to try it, try out these directions: http://www.resetyourweightbasics.com/healthy-kefir-soda/. I can’t explain this, but water kefir really does seem to decrease appetite. I don’t vouch for this effect because I do not find any scientific literature on it except the one animal-model reference below, but try it for yourself and see what you think. Your grains will multiply steadily and always need food. If you want to store them for awhile, put the jar in the refrigerator immediately after adding fresh sugar water and they will keep about two weeks. For longer storage, drain them every two weeks and add fresh sugar water. You’ll soon have plenty of grains to give to friends. Internet sources tell you to add dried fruit and eggshells for minerals, but I have never done that and my grains multiply just fine. It might be that the coconut sugar I use provides the grains with any minerals that they need. My grains are tan rather than white after several generations in coconut sugar. In the picture below, what looks like a film on the surface is actually a haze of tiny bubbles of carbon dioxide bursting. I can’t stop talking about the marvelous Noma Guide to Fermentation. It doesn’t address water kefir specifically, but I’m curious about the possibilities of cooked-down kefir essence used in the way that the Noma people use kombucha essence. It might also be possible to grow out water kefir grains in other fluids such as juices. After making a few batches of standard water kefir, you will have plenty of grains with which to experiment. Many internet sources that discuss water kefir give references for its health benefits. However, I spent a cold gray afternoon indoors looking up those references and found that, as I had suspected, nearly all of them actually refer to milk kefir. I don’t find a lot of data on whether water kefir contains the same microorganisms as the milk product, and certainly its nutrient content is different. Here are a few references on water kefir specifically. This last one is particularly interesting because the mice given kefir matrix exopolysaccharides showed anti-obesity effects on an excessive diet and also showed higher levels of Akkermansia bacteria in their feces. Other data (https://www.ncbi.nlm.nih.gov/pmc/articles/PMC3670398/ ) indicates that the presence of Akkermansia species in both rats and humans inversely correlates with obesity, probably via interactions with the gut epithelium. Please don’t try to make too much of this: the science of the biome is in its infancy and we know very little about how to impact it for specific effects. So I can only say that water kefir won’t hurt you and may have some beneficial effect. Fermentation IV: The Wine at Your Table. For the previous decades of my adulthood I had little or no interest in winemaking because I’m fond of good red wines and suspected that it would cost plenty to make wine at home and not produce a great result because I don’t have the right facilities for aging. But over the last year I’ve started fermenting lower-alcohol wines, meads, and cyzers meant to be consumed within their first year. They are not made to be fussed over but to be quaffed casually and with immediate pleasure. They are made as casually as they are consumed, without all the tedious sterilization, measuring, and worrying that so often saps the fun out of home brewing. 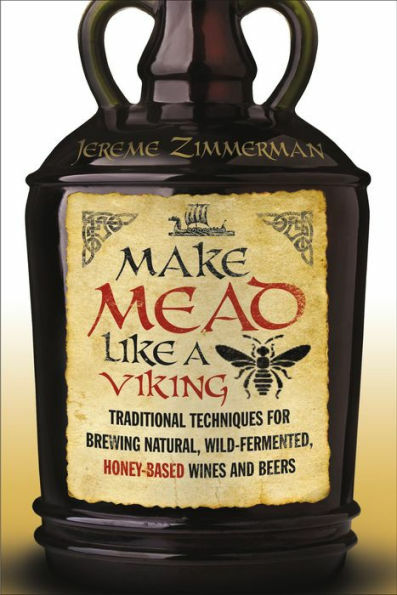 My bible for fermenting for fun is the delightful Make Mead Like a Viking, by Jerome Zimmerman. It’s a fun read and offers a few explicit recipes and lots of general information and assurance that your distant ancestors did this without making a big deal about it and so can you. Don’t invest in a lot of sterilization equipment because soap-and-water clean is fine. Don’t worry about exact recipes because it’s part of the fun to try something different every time. I will not be giving any explicit instructions here, just a general idea of what I do, because if you are an experienced fermenter you will be familiar with these principles and if you aren’t you need the book. The equipment to get started is Mr. Zimmerman’s book, a couple of 2-gallon plastic brewing buckets and fermentation locks, a 6-foot or so length of food-grade plastic tubing for siphoning, some clean gallon bottles for the finished wine, and ingredients. Sugar, honey, or fruit juice provide the food for the yeast. A packet of commercial wine yeast gets you off to a good start, although wild yeast isn’t that hard to use. Personally I don’t go in for the equipment that allows you to calculate your finished alcohol level precisely. I rely on the following general proportions: a pound of honey or about 1.5 pounds of sugar per gallon of water ferments out to 4.5 or 5% alcohol. Double the sweetener per per gallon and it ends up at about 10%. Once you’re up to triple sweetener per gallon, your yeast is likely to be killed off at some point and leave you with residual sugar, unless you used champagne yeast, which tolerates a lot of alcohol. But then your drink is “hotter” and higher alcohol than I’m looking for. Quadruple sweetener will in my opinion leave you with syrup, although some people love the effect. Apple juice will ferment out to about 4% alcohol, more if you add sweetener or sweeter juices. For the most part, I plan to finish at about 7.5% alcohol, 10% at absolute maximum. Flavoring depends on what you’re in the mood for. Don’t be afraid to experiment. 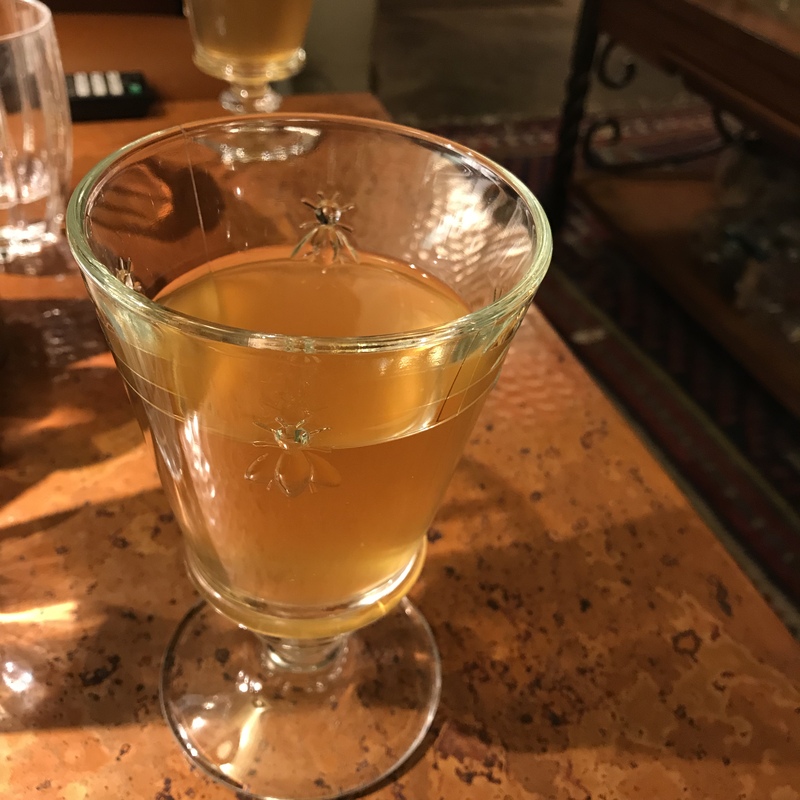 One of my favorite late-summer wines was made by juicing three cantaloupes and adding the juice to a gallon of apple juice, along with half a pound of sugar dissolved in 3 cups of water. 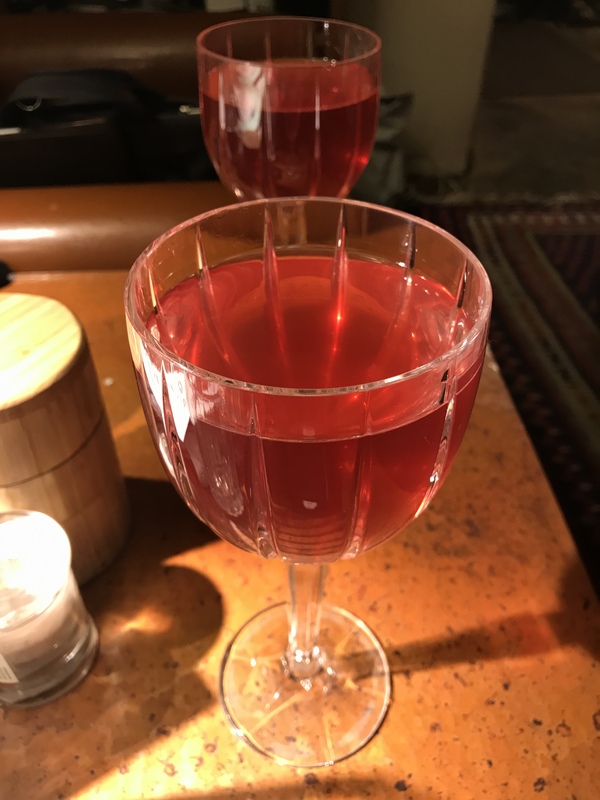 Another remarkable wine was made with a dozen juiced prickly pears, the juice of two blood oranges, and a gallon of water sweetened with honey and sugar in equal parts, with one of the squeezed blood orange halves thrown in to ferment in the liquid for the first two weeks. Prickly pears have little flavor but exquisite color, and this wine, which can be seen above and in the picture at the top of this post, is one of my favorites. So far I’ve used juice from my own grapevine, blackcurrant juice, juiced aronia berries, juiced blackberries, and juiced dark cherries. I always prefer honey as the sweetener, but some people don’t care for its earthy undertone, so sugar is easier on some palates. Apple-strawberry cyzer, shown above, is another surprise favorite with a subtle note of strawberry that makes for delicate, delicious sipping. 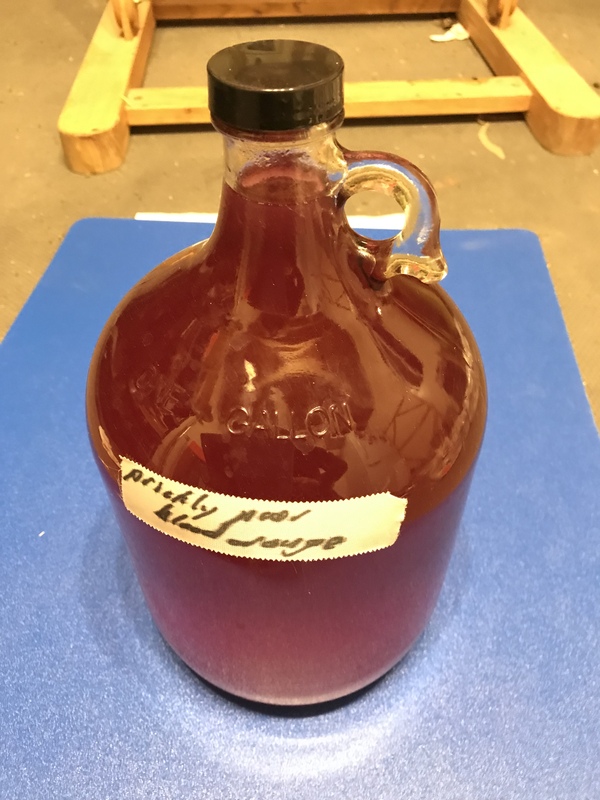 Blackcurrant mead is musky-sweet on the palate. Although I may make 5 gallon batches of things that came out well if I can get the materials, I always start with between a gallon and gallon and a half, which fits neatly into a 2 gallon fermentation bucket. Make up the mixture of your choice, put it in a clean bucket, snap the lid on, and fit a fermentation lock. Make sure you have put fluid in the lock to the right level. I use vodka instead of water in the fermentation lock, to make sure that no intrepid fruit flies get through and turn the wine to vinegar. Then, wait at least three weeks. 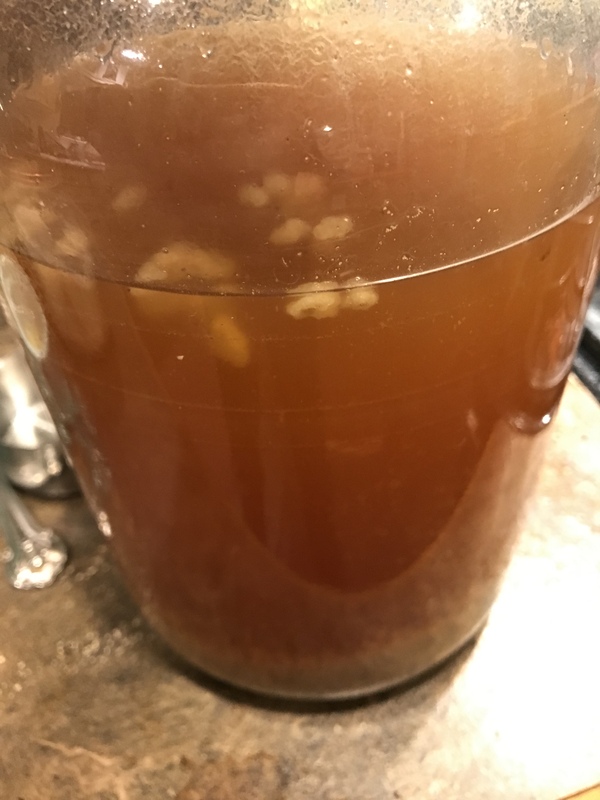 Sometimes you will hear the must making surprising noises, and when it starts to ferment actively the fermentation lock will make an attractive gurgling sound. After 3 to 4 weeks, open the bucket making sure not to shake it around and disturb the sediment, and siphon the fluid off the yeast and other sediment into a second clean bucket. Cover it, put a fermentation lock on, and let it sit for another 3 to 4 weeks. Again siphon the wine or mead or cyzer off the sediment, this time putting it in a gallon bottle and put any of that won’t fit into clean wine bottles or canning jars. Of course you could put it all in bottles, but I prefer to avoid the fuss of cleaning and storing all those bottles. At this point, taste it. Generally it will be fermented out dry, and many fruit mixtures taste better when a little sweetness is added back. If I feel that it needs some sweetness, I sweeten very cautiously with pure liquid sucralose, stirring and tasting after each drop so that I don’t overdo it. If you prefer you can use sugar, but remember that it must be stored in the refrigerator after that, and even so, the yeast will slowly ferment away your added sugar and produce pressure inside the bottle that can lead to a minor but messy explosion. You can filter repeatedly if you want a sparkling clear product, but I do think you lose flavor in the process and I generally don’t. Store in the refrigerator. Often these ferments taste better cold, and if you do want to drink them at room temperature just get them out of the refrigerator an hour before wanted. They do not have a high alcohol content to preserve them, and so cold storage serves this function. Plan to drink them within a few months. 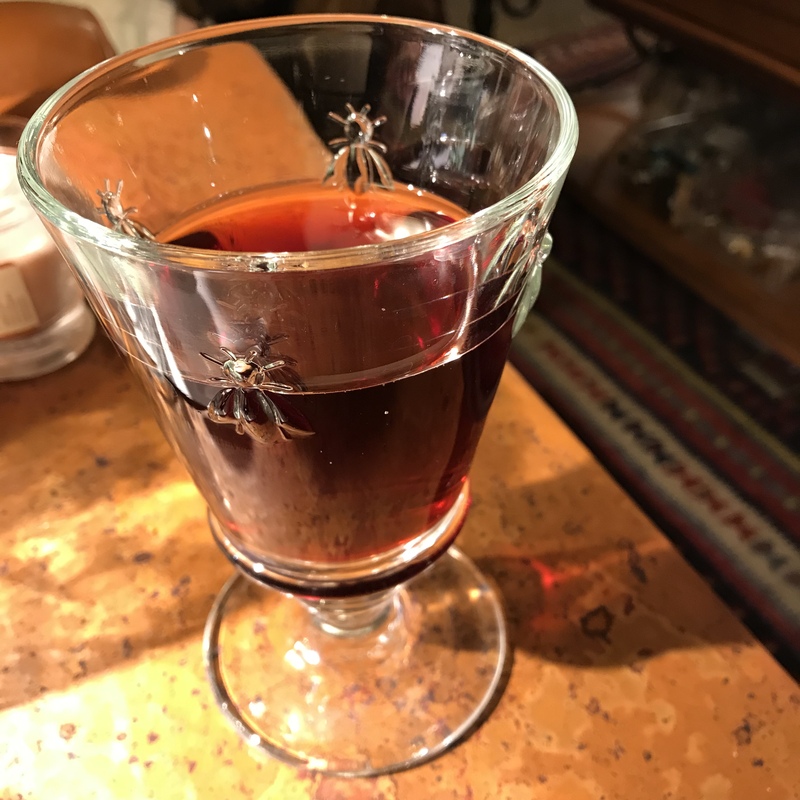 I have made higher alcohol meads that I kept for much longer times, and they certainly improved with keeping, but if the alcohol content is low they aren’t likely to hold in good condition. If you really start enjoying yourself and want to get wilder, you will want to own Pascal Bauder’s The Wildcrafting Brewer, in which wildcrafted ingredients and wild yeasts are used to produce drinks that are the essence of a particular bit of earth at a particular time. 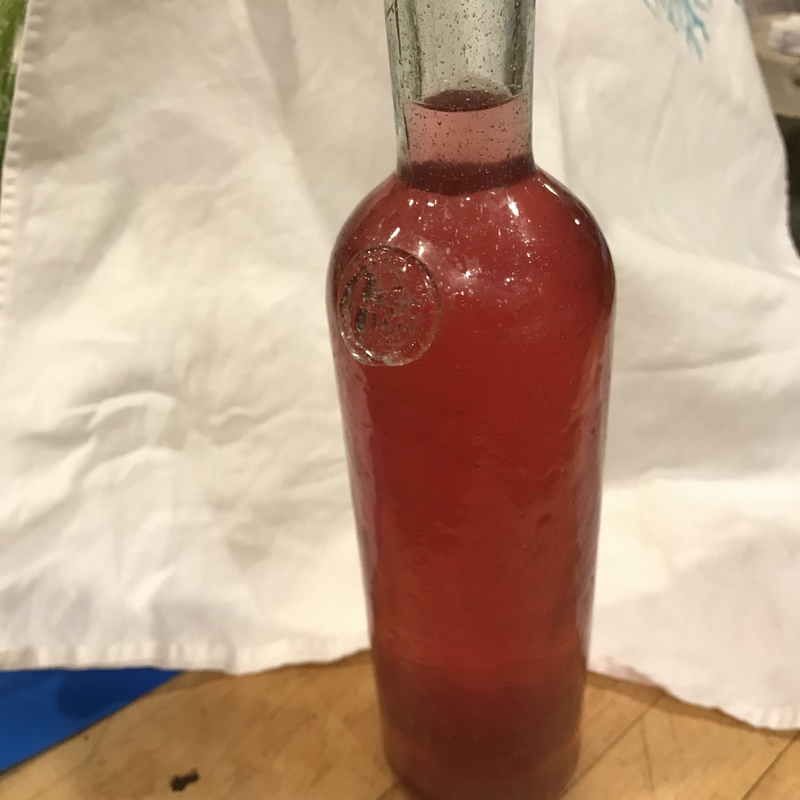 I first wrote about red wine vinegar in 2009, and while I have made and consumed it steadily since then, there didn’t seem to be much more to say about it. 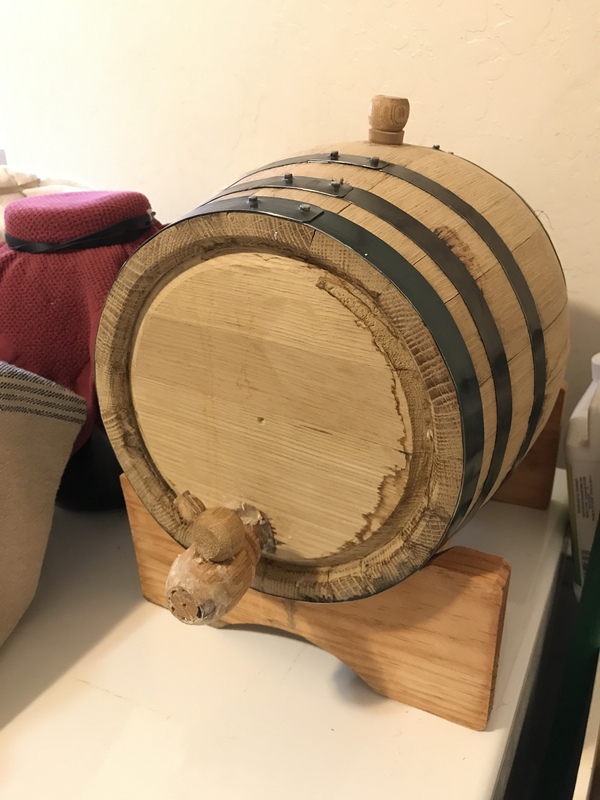 My husband gifted me with a marvelously cool 2 gallon oak barrel to keep it in, but the vinegar was the same. But then came The Noma Guide to Fermentation, and I’m left wondering why I was so unimaginative. Their chapter on vinegars has lots of interesting ideas but the ones that excite me the most are elderberry “balsamic” and black garlic “balsamic.” I suspect that I will end up combining the two, since I have some elderberry wine fermenting and the port-like notes should be a perfect complement to the deep umami of black garlic, and for even more depth I’ll use red wine vinegar to start the acetic fermentation. Basically, if you have a good strong vinegar mother, you can ferment anything mildly alcoholic into vinegar. The acetobacter bacillus converts ethanol to acetic acid in the presence of oxygen, so if you want to use your own fruit you need to ferment it into wine first, but that’s easy enough. 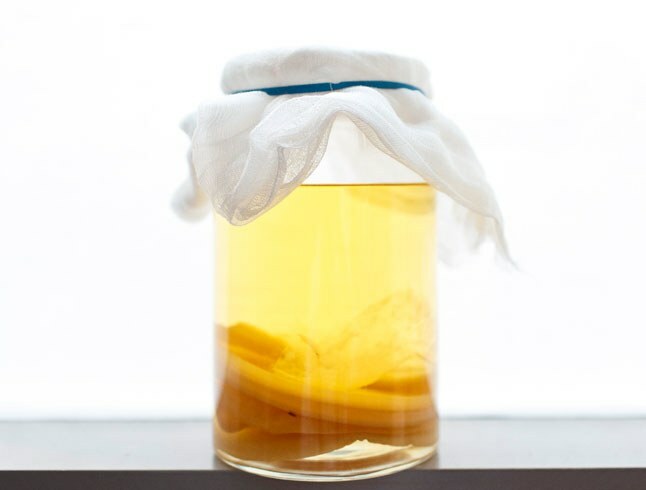 Once you have wine or mead or hard cider to ferment into vinegar, you can do it in quart mason jars, with a dish towel tied tightly over the top to allow oxygen in and prevent winged visitors, and make several kinds of vinegar in a square foot of counter space. Or if you have a lot of ideas and a tolerant spouse, you can occupy all available surfaces. Just make sure you have a plan for what to do with it. You can cook with it as detailed in my 2009 post, and if you still have too much it makes a fair non-alcoholic drink stirred into sparkling water. Stir a shot into a tall glass of chilled sparkling water, with some natural or artificial sweetener. I like a shake of cinnamon on top. This isn’t a kid’s drink, and only the adults are likely to enjoy it, and not all of them by any means. Some will dislike the sharp edge, and a dash of fruit juice or a little honey may take the curse off for them. But those of us who drank the old cider-vinegar-and-honey drink growing up generally came to enjoy the sweet-sour flavor and like this use of vinegar. This is already known to everyone, but it bears occasional repeating: you can also infuse vinegar with nearly anything that suits your fancy. Tarragon is a classic, but I prefer thyme infused in red wine vinegar, using about one big bunch of thyme per pint of vinegar. Flavorful fruits are also a possibility. Be aware that Acetobacter does one thing superbly well, and that is converting ethanol to acetic acid. If you add any source of unfermented sugar directly to your ferment, it will remain as sugar. You can use this effect deliberately to make fascinating semi-sweet or agrodolce vinegars. One that I particularly enjoyed was made by dehydrating Concord grapes from my vine until they were somewhat shriveled and approaching the raisin stage, covering them with red wine vinegar, blending with a stick blender until the grapes were roughly chopped, and then infusing the mixture for a couple of weeks. 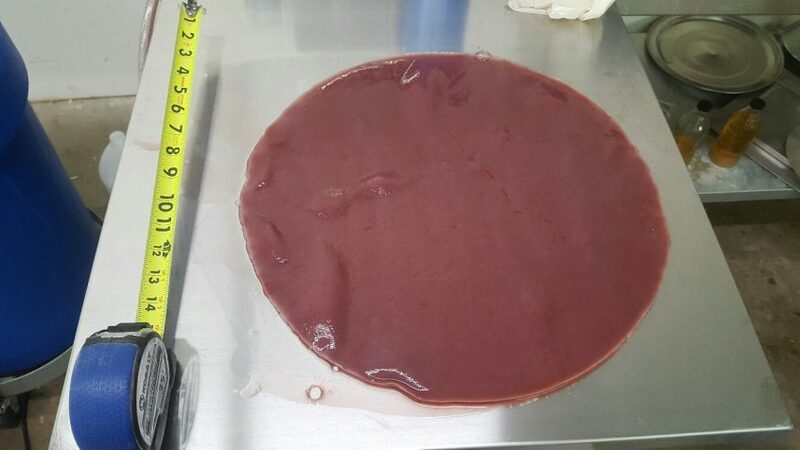 The grape bits were then strained out, and the vinegar was richly flavored, barely sweet, and carried some of the unique tang of the Concord grape. 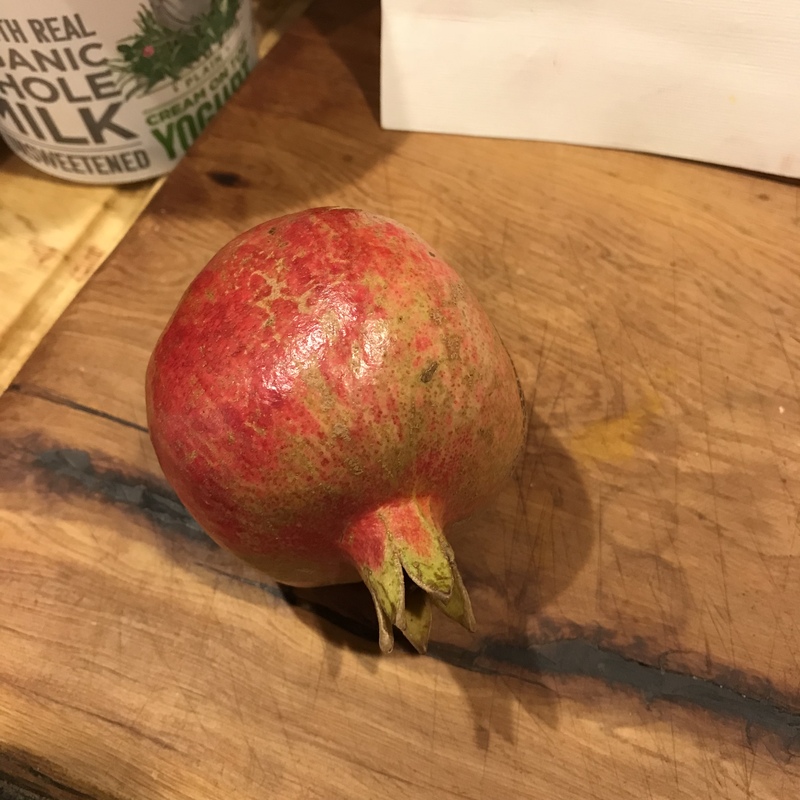 I’m looking forward to making pomegranate vinegar in the near future. Blackberry vinegar would probably be wonderful. It may be that live vinegar contributes to your biome and general health, and definitely it contains the antioxidants of the original wine with little or none of the alcohol. If you get interested in culinary uses for your vinegar, you will enjoy Samin Nosrat’s Salt Fat Acid Heat. The section on acid in cooking is invaluable and will lead you to analyze food that lies a bit too heavy on the tongue and realize that a bit of acid could have sparked it to deliciousness. Canal House makes and uses a lot of vinegar in their cooking, and you can find some recipes and a good article on making vinegar here. If you have a healthy one, the question always arises of what to do with the “pups” or new layers of mother that are continually forming. Some people eat them, but then some people eat their own placentas. No judgement implied, but I wouldn’t eat either one. If your friends don’t want one, put it in the compost or bury it in the garden or whatever makes you feel okay about letting go of it. 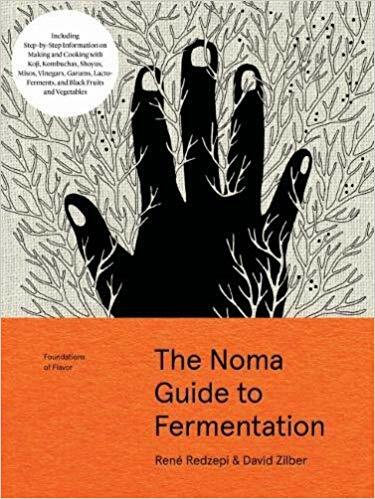 Yesterday’s post was about a truly remarkable cookbook, The Noma Guide to Fermentation. Today I’ll talk about a kind of high-temperature enzymatic reaction, the making of black garlic and other blackened goodies. Properly speaking this is a Maillard reaction and not a fermentation, but let’s not quibble when the result is so delicious. These products need to be made at a temperature of 140-150 degrees. This is hard to achieve without a specially built chamber, although I notice with interest that a household appliance built especially to make black garlic is available on Amazon. A rice cooker on “keep warm” is suggested, but mine turns off automatically. I am trying my large crockpot on the ‘keep warm” setting and the lid cracked to keep the temperature lower. But the process takes weeks, so I also bought some finished black garlic ready to use. If you go in for this cheat, you have the option to get the Asian kind that is one single huge clove of garlic about an inch across as shown above, but if you buy from Black Garlic North America you can buy it peeled fairly economically or (my choice) you can buy 1.5 pounds unpeeled and have the skins available to put in simmering chicken stock, giving it wonderful depth. It is also sold in tiny little packets in many grocery stores, but I do not recommend that form. 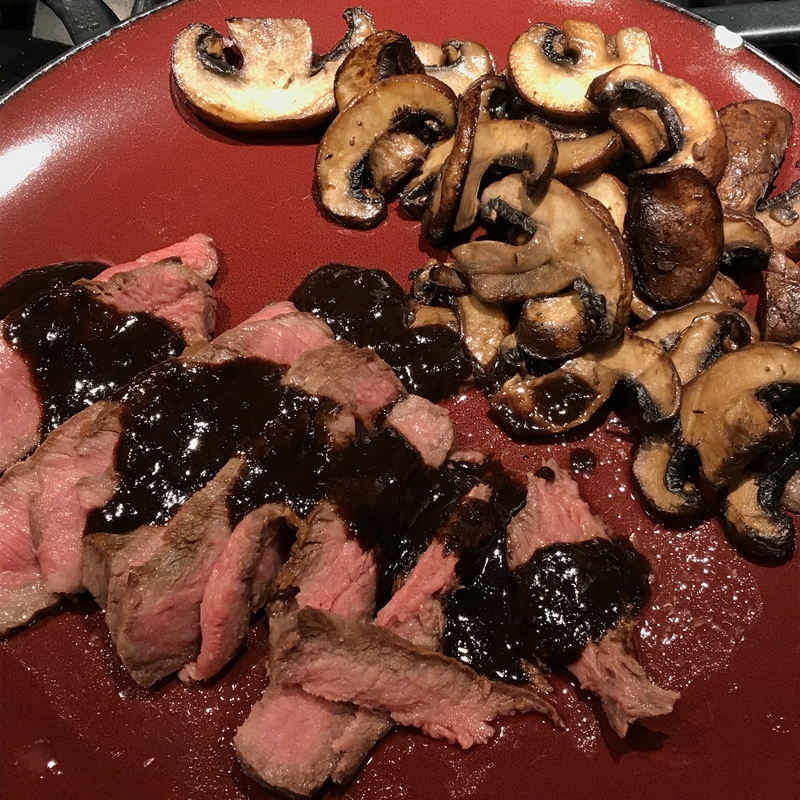 It is often dried out and unpleasant by the time you get it when it should be moist, chewy, and have the complexity of good balsamic vinegar with a different flavor. As for using it, one of my favorite simple uses is to pound two huge single cloves or 5 to 6 regular cloves of black garlic to a smooth paste in a mortar and pestle with a little salt, then pound in 2 tablespoons of cold butter and a teaspoon of very good balsamic vinegar (nothing from the grocery store.) Pound until you have a smooth mousse-like paste, then use it to top steaks, spread it on bread, or toss with a little pasta. To make the heavenly sauce above is only slightly more complex. Make the black garlic butter paste as described. After pan-grilling a nice bit of steak, while the steak is resting deglaze the pan with water or red wine, boil down the fluid hard, add a cube of beef glacé from the freezer, and when the glacé is melted, add the black garlic paste and stir in thoroughly. Add a little water to thin the sauce to desired consistency, taste for salt, slice the steak, and pour the sauce over the slices. This amount of black garlic paste makes enough for two people. The recipe is very adaptable and doubles easily. It’s rich and meaty, full of umami, and enhances everything it touches. Tart it up with some extra butter if you want it even richer. It also does wonderful things for ordinary supermarket cremini mushrooms, and even better things for more flavorful mushrooms like shitakes. Needless to say, make beef glacé if you don’t have it, and don’t even think about using a boullion cube. Or pound out the garlic cloves without adding the other ingredients and put them in vinaigrette. 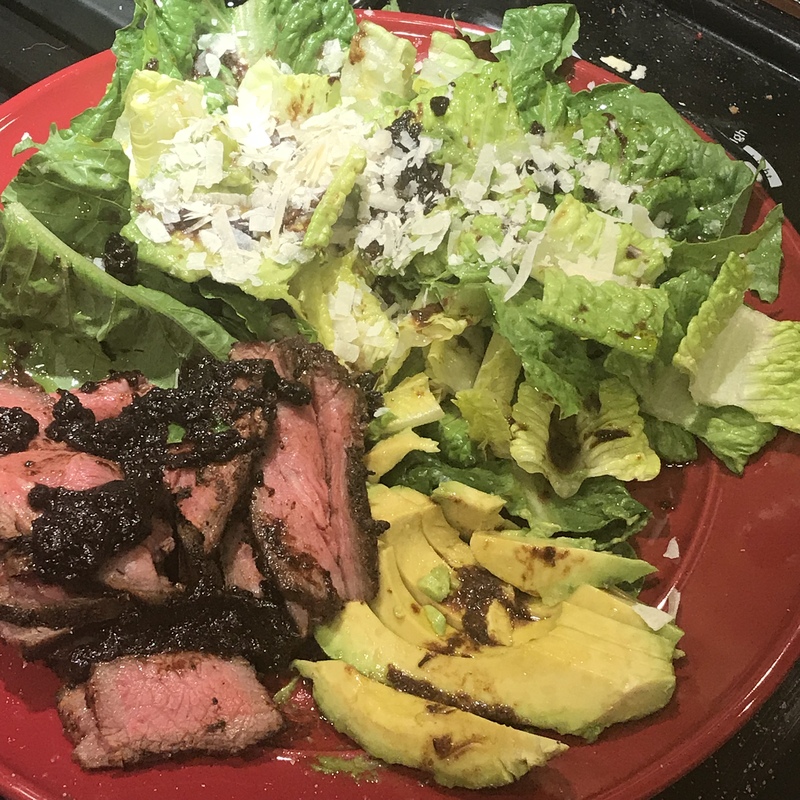 Above, several regular-sized cloves of black garlic were pounded and roughly mixed into half a cup of red wine vinaigrette and spooned over cold sliced steak, sliced avocado, and salad. This might sound like too much but the flavor of black garlic is mellow and surprisingly low-key and you need a lot when it’s the main flavoring. I was rather startled to find that all kinds of miraculous health benefits are attributed to black garlic, to the extent that it is sold in capsules for people who want to take it more conveniently. That anything as meaty and delicious as black garlic should be ground up and put in capsules is weird to me, sort of like taking steak in capsules, but suit yourself. 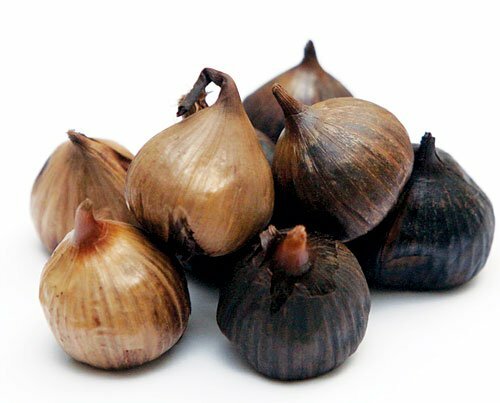 Incidentally if you grow a lot of garlic and have trouble storing it through the winter, it might be worth rigging up a chamber so that you can make black garlic in quantity. I would imagine that it could be sold quite profitably at farmers markets, since I almost never see it in those venues. However, I am nowhere near handy enough to tell you how to make a 140 degree chamber without burning down your house. Know your limitations. ‘The ”other goodies” refers to the fact that the same process can be used to blacken some other foods, with varying results. Please use the Noma people as your guide if you want to try this, since I am experimenting with it but my products are not ready yet. Their descriptions of apples blackened in the fermentation chamber, then dehydrated until chewy, then coated in very dark chocolate, sound luscious. I am blackening some quinces, and I’ll report back if the result is worthwhile.